The establishment of typologies, systems for the classification of objects into groups according to traits held in common, is fundamental to the modern field of archeology. While it is very important to keep in mind that, when dealing with the ancient world such systems are modern impositions, detailed analysis of archaeological trends would be all but impossible without this vital shorthand. The benefits of typological analysis go far beyond convenience of reference: typologies aid in analysis, in establishing patterns of use, and in determining technological chronology. Like living organisms, the human artifacts of the ancient world tend to exhibit gradual alterations in form over long periods of time interrupted by brief periods of rapid change. This is certainly true of the development of the sword in Europe during the early medieval period. Many of the swords dating from this period appear, at first glance, to exhibit only the slight refinement of designs already in use during the late Roman period, or even earlier. This apparent homogeneity is deceptive, and to accept such a view is to deny discernible differences in blade shape and design capable of illuminating the changing nature of warfare, as well as the advent and dissemination of new technology during this key period of European cultural and political development. 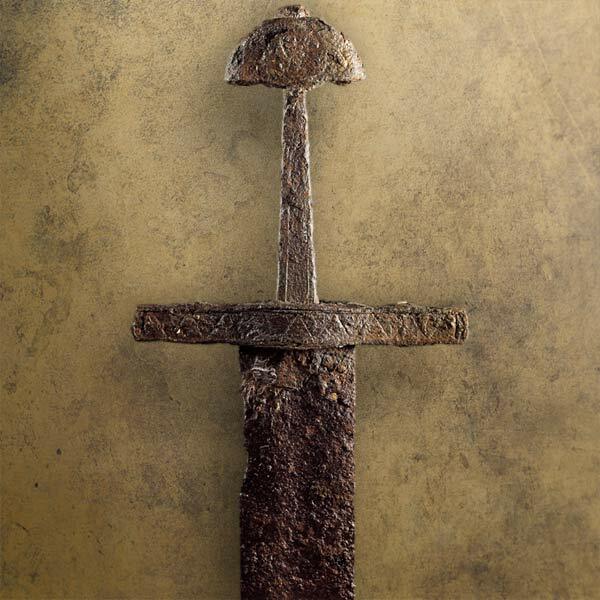 Since the early 20th century, a great deal of attention has been devoted to the evolution of medieval European swords. Seminal works and studies have taken as their aim not only the cataloging and analysis of such weapons, but the development of accurate and functional systems for their categorization. Some of the most notable of these works include Jan Petersen's Die Norske Vikingesverd (1919), which categorized Norwegian swords of the Viking period according to hilt characteristics; Elis Behmer's Das Zweischneidige Schwert der Germanische Völkerwänderungszeit (1939), dealing with swords dating from the Germanic migration period; and Ewart Oakeshott's The Archaeology of Weapons (1960) which established, as part of a larger survey of European weapons types, systems for the categorization of swords according not only to hilt characteristics, but to blade morphology as well. Building off of Petersen, Oakeshott's typology begins in the middle of the 11th century and continues through the dawn of the Renaissance. In 1991, Dr. Alfred Geibig, a journal editor of the Art Collection of the Veste Coburg (Kunstsammlungen der Veste Coburg) and chairman of the Historical Society for Weapon and Costume Research (Gesellschaft für Historische Waffen und Kostümkunde) published Entwicklung des Schwertes im Mittelalter (The Development of the Sword in the Middle Ages). The work was in part an attempt to address a gap of the published study of the sword: the continental material dating from the dawn of the 8th century through the close of the 12th. The work, which catalogs some 347 swords and involves the survey of some 600 museums and private collections, deals with swords found within the approximate boundaries of East Francia as ruled by Ludwig (Louis) the German during the 9th century. Based upon exacting examinations of each piece, Geibig formed his own system of blade typology in addition to a wonderfully detailed system of hilt classification based upon combinations of hilt components as viewed from various perspectives. Geibig took as the basis for his system of classification precise metrical distinctions, rather than what he viewed as potentially subjective visual differences of morphology. This approach resulted in a fascinating system of classification capable of communicating a great deal of information, but which occasionally requires a similar amount of statistical information in order to definitively establish the classification of a given blade. A potential objection to the broad application of Geibig's typology is that in Entwicklung des Schwertes im Mittelalter all of the swords and sword fragments utilized in the creation of his hilt and blade types were found within the limited geographical area of East Francia, roughly corresponding to modern day Germany, with some additions. This is not so significant an objection as it might at first seem. There is general consensus that swords of Frankish manufacture dominated the weapons trade of the early medieval period. 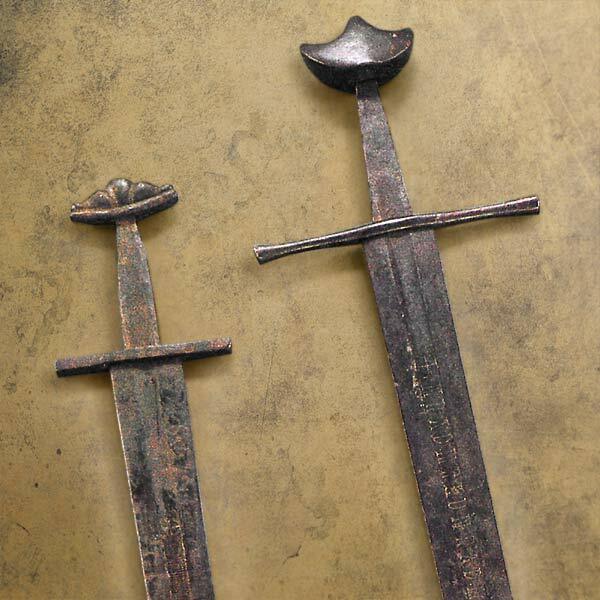 The famous Ulfberht swords almost certainly originated in the Rhineland, and this area in particular seems to have been the source for many of the improvements in both blade design and metallurgy which would play a key role in shaping the development of the medieval sword. Swords traceable to this area have been found in large numbers across Europe, and while the idea that all Viking swords were of foreign manufacture is no longer as fashionable as it once was, it is still accepted that weapons of Frankish/Rhenish origin were, at the very least, much sought-after and broadly distributed. The popularity of sword blades manufactured within what is now Germany during the early to high medieval period was so great that substantial numbers of imitation Ulfberht blades, often possessing telltale misspellings of the legendary moniker, have been found with a distribution range nearly as wide as that of the genuine examples. Taking this popularity into account, it could be argued that the blades surveyed by Geibig are likely to represent a reasonable cross-section of the blade types in use throughout Europe during their time period, and that their evolution likely mirrors that of blade technology as a whole. Geibig divided the blades he surveyed into fourteen types, with a further five subtypes, or variations, also being present. For each type he identified the metrical characteristics, the key relationships of length and width between different blade elements as well as methods of construction and decoration, and the time period during which each type enjoyed its greatest popularity. A summary of each blade type appears below, incorporating information from throughout Geibig's text, his diagrams, and from his extensive metrical tables. Some of Geibig's more subjective categories have been eliminated as have the metrical ranges of the actual swords surveyed, in favor of the maximum range for each type and characteristic. For purposes of clarity and brevity I have included here only the pommel types, categorized by the frontal (face-on) view, which have been found with each blade type, as opposed to the specific variants of combination hilts which Geibig lists. To include such information would require a greatly expanded discussion of the pommel and hilt types in their various dimensions, a topic somewhat beyond the scope of this article. In assembling the notes for each type, I have borrowed liberally from Geibig's own text and have added clarification where necessary. The decorative and construction elements listed as accompanying each blade type should not be taken as absolute restrictions, but merely as elements present within Geibig's surveyed examples. The pommel types referenced below are accompanied by illustrations, and in them those familiar with Petersen's Viking hilt Typology and/or Oakeshott's simplification of it, will find much that is familiar. Geibig's Type 6 can be recognized as a form of Petersen's Type K for example, just as Type 9 corresponds to Type O. The later pommel types, all variants of Petersen's Type X, can be found within Oakeshott's pommel types of 1100-1325 as detailed in The Archaeology of Weapons. Variants of Geibig's Type 13 cover Oakeshott's Type C and Type D. Type 17 bears a resemblance to Type N. Type 19 follows Type E, and so forth. Some differences will, of course, be apparent. Geibig's Types 2, 3 and 4 do not easily fit into Oakeshott's typology. Type 2 and Type 3 may be Mannheim variants according to Petersen, but Type 4 seems lost amongst his "distinctive types." These variations in emphasis and distinguishing characteristics are only to be expected. All photographed examples accompanying the various blade types below are taken from Geibig's catalog save for Type 14. 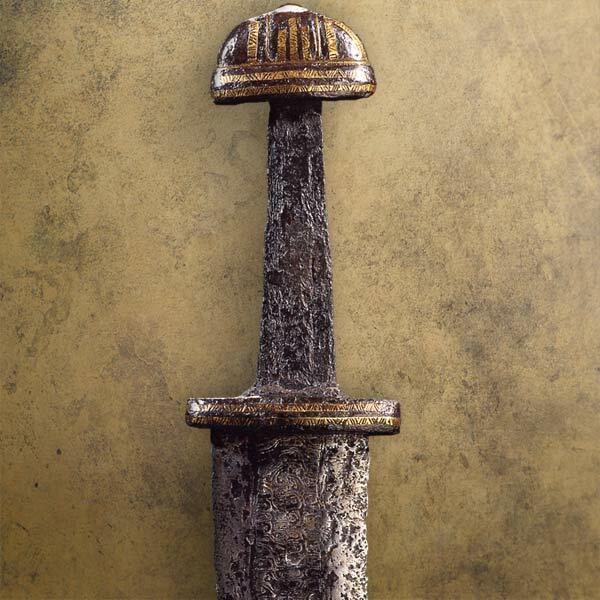 As Geibig does not provide a photograph of this type's sole example, a photograph from Ian Peirce's Swords of the Viking Age depicting a similar blade has been substituted. This type is short and stout, with parallel or nearly parallel edges only coming to a point near the tip. These blades generally have either a very shallow fuller or no fuller at all. The overall length is almost always under 31.5", and in some cases it may be even less than 27.5". Blades of this type tend to be very "point-heavy." All of the hilt types with blades of Type 1 that have been found appear to date from before circa 800 CE. These blades are of a transitional type and possess a slightly more refined appearance owing to the introduction of a convex curve along the blade edge. The fuller is generally well-defined and for the most part mirrors the shape of the blade, reaching a short, rather blunt point near the tip of the blade itself. The type is divided into three variants. Variant A represents the heavier, broad fullered examples (greater than .9" wide, 27.5" to 31.5" long). Variant B represents the slimmer, lighter blades (~.75" wide, 25.25" to 27.5" long). Variant C examples fall somewhere in-between the other two. Type 2 blades first appear around the mid-8th century and can, on the basis of the hilt types which accompany them, be assumed to have been in use at least through the first half of the 10th century. It cannot yet be ascertained whether these later examples represent re-hilted older blades or newly produced blades of an older type. Blades of this type largely conform to the same outline as blades of Type 2, though they are somewhat shorter and proportionately slimmer. The primary difference, however, is to be found in the taper ratio of the fuller over the first 15.75" of length. This type first appears somewhat later than Type 2, near the end of the 8th century, and in smaller quantities. It remained in production throughout the 9th century, and continued in use possibly as late as the end of the 10th century in connection with certain hilt types, specifically Type 12v.I, Type 13v.I, Type 15v.I and Type 16v.I. The later examples of this type display something of the longer, more pointed forms which will later predominate with the emergence of Type 4 and Type 6. Edges on this type are nearly straight with a clear taper, though the taper ratio of the fuller may vary considerably. Though similarities between this type and Type 2 and Type 3 do exist, Type 4 blades can be differentiated from these types by the substantially increased taper ratio of the blade. This type's strongest resemblance is to Type 5, though they may be distinguished by their smaller size. Type 4 and Type 5 probably emerged alongside each other, most likely during the later half of the 10th century, and from that point gradually came to replace the previously dominant blades of Type 2 and Type 3. Type 5 blades are slimmer and longer than blades of the first three types, and feature a continual taper with a slight convex curve to it. This convex curve enables a flowing transition into the blade's long point section. This type has two variants, distinguished from each other according to the taper ratio of the fuller. The first variant possesses fullers of uniform width while examples of the other variant feature fullers having a taper ratio of approximately 1.06:1 over the course of the first 15.75 inches. Blades of this type appear to have emerged around the same time as blades of Type 4. Taking into consideration the hilt types with which these blades appear, it is possible that blades of Type 5 continued to be produced into the 12th century. Blades of this type taper continuously towards the point with straight edges. The type is divided into two variants according to the point section: blades of Variant A possess a flowing transition into the point with a slight convex curve, while those of Variant B possess a lower taper ratio and a shorter, triangular point section. Type 6 blades often appear in conjunction with long-lived hilt types, causing precise dating to be difficult. However, it can be established with some certainty that this type was a dominant one in the mid to late 11th century, and may have continued, along with Type 5, well into the 12th century. This type has very slim blades of medium length with narrow fullers. The blade edges follow a gentle convex curve which flows into a point section of medium length. The association with hilt Type 16 and Type 17 indicates an origin for this blade type between the end of the 11th century and the middle of the 12th century. These are heavy, cutting blades featuring initially straight edges, drawing into a gentle convex curve before flowing into the point section. The visual effect is to orient the viewer towards the base of the sword. This type bears some visual resemblance to Type 5. Blade Type 8 can be said with certainty to date from as early as the 12th century owing to its limited number of associated hilt types. In relation to a very narrow blade, the edges on this type run nearly parallel with only a slight convex taper. The only obvious curvature occurs within the point section, beginning around the end of the fuller. The outline bears some resemblance to Type 5�Type 7. These are very long and somewhat heavy blades that taper continuously along relatively straight edges, drawing in only near the end of the fuller, where they create a narrow, convex point section capped by a rounded tip. The two variants can be distinguished from one another primarily on the basis of blade width when measured at the base. Variant A features a width of 2.28�2.52 inches while Variant B examples are slimmer, ranging from 2�2.2 inches. These blades appear to bear some resemblance to those of Type 6 and Type 7 and are primarily dated to the 12th century. This type has very long, broad blades with heavy cutting edges and comparatively narrow, short fullers. The edges are straight and taper continuously until reaching a very short, convex point section. Like Type 9 and Type 10, this type is identified with the 12th century. Here we see very long and heavy blades with extremely narrow, short fullers. The blades taper continuously with straight edges until the end of their fullers, where the edges curve inward to form long, convex point sections. Some resemblance to Type 9 is apparent. Blades of this type appear near the end of the 12th century and remained in production well into the 13th century. Type 13 blades are very long and relatively narrow with straight edges that taper continuously. Their point sections are only a guess, as the examples surveyed by Geibig are missing this area of the blade. This type is roughly contemporary with those of Type 12, first appearing near the end of the 12th century. Only one example of this type was present in the samples surveyed by Geibig. The blade itself is rather narrow in relation to its length. This is an early blade type, dating prior to the 9th century. The sword pictured here is not the sample sword, but one of the same type. Geibig's work is one of the finest publications on medieval swords available today, and the breadth and depth of the information it contains on the swords of this period is nothing short of astounding. While the extensive photographic catalog it contains would be of great value to enthusiasts of any linguistic background, the fact that the text is entirely in German and the prohibitive price tag attached to the tome (some 250 Euros or more) have limited the English-speaking world's exposure to what would be essential reading within the field. Ian Peirce, in his wonderful Swords of the Viking Age, took the first step towards rectifying this by including limited summaries of the first five of Geibig's fourteen blade types. This summary represents a further step in the on-going effort to expand the English world's exposure to this invaluable resource. Christopher Liebtag Miller, or C.L. Miller as he is known to many, is a writer and music critic currently living in South Burlington, Vermont. His interest in the culture and history of Medieval Europe has been lifelong, and his favored area of study is the Holy Roman Empire of the Ottonian, Salian and Hohenstaufen emperors.